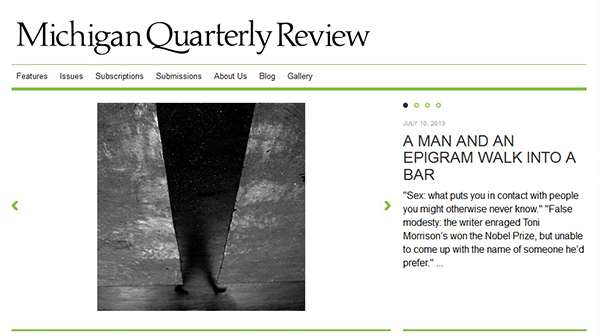 Louis’ essay, “A Man and an Epigram Walk Into a Bar,” appears as the Afterword to Thomas Farber’s collected epigrams, The End of My Wits (Andrea Young Arts/El Leon Literary Arts, 2013), and is published online at Michigan Quarterly Review. Take no prisoners. This entry was posted in Book News on August 5, 2013 by admin. I do things instinctively, what feels emotionally true. Later, I might realize that they are not logical or chronological, but I don’t let that sway me from what feels right. I met this extraordinary young woman. A year later she was dead, and by her own hand. I barely knew her yet felt a tremendous loss like nothing before. Hers was such a white light. As one friend said, let’s remember her the way she was. That’s such a human response necessary for survival. Yet, I felt her so alone on that last hour. Alone, and very brave. But alone or in company, it is alone that we meet death. Putting the scene of the burial before the death, butting it up against the exuberance of that day we met, giving the reader no warning, seeing her rich potential and the loss of hope, for us and for her, showing that everything can change in a moment, the stark finality of death — I wanted the reader to feel some measure of that. This entry was posted in Ask Me on August 5, 2013 by admin.